Perforated metal outdoor table supported by heavy-duty 4" x 4" powder-coated legs with two un-attached seat benches. Semi-solid top and seats with smoothly rounded edges and corners for a pleasant and comfortable look. Model is available in two lengths to better fit your available space. 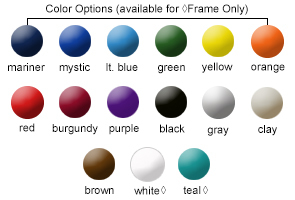 Top and seats are finished with a lightly textured Polyethylene coating in the color options shown below. 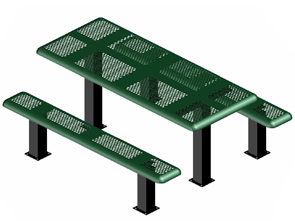 Semi-Solid Perforated Metal Top and Seats. Durable 4" x 4" Square Legs. Rounded Edges for Safety & Comfort. # 11 Gauge Perforated Metal Top and Seats.